Everyone knows life does not get better than cruising down the open road on two-wheels with your best bud by your side! 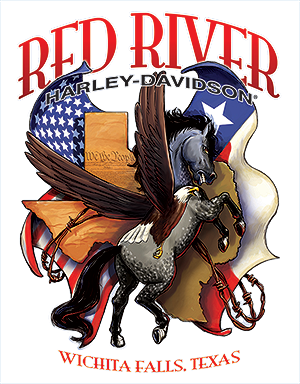 Whether it be your brother/sister/bestfriend/wife/husband/Father/Son/Mother/Daughter/Grandpa/Grandma/partner in crime/BFF/favorite ally - whoever that special person in your life may be RRHD has the GREATEST-once-in-a-lifetime-opportunity on two wheels available NOW! In-Store right now, we have quite an anomaly! 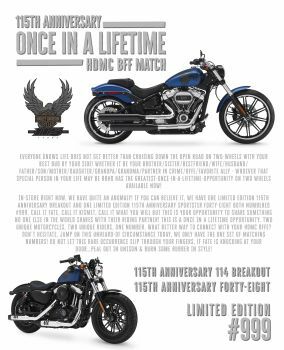 If you can believe it, we have one Limited Edition 115th Anniversary Breakout and one Limited Edition 115th Anniversary Sportster Forty-Eight BOTH NUMBERED # 999. Call it fate, call it kismet, call it what you will but this is your opportunity to share something no one else in the world shares with their riding partner! This is a ONCE IN A LIFETIME opportunity. Two unique motorcycles, two unique riders, ONE NUMBER. What better way to connect with your HDMC BFFE? Don’t hesitate, jump on this unheard-of circumstance today, we only have the one set of matching numbers! Do not let this rare occurrence slip through your fingers, if fate is knocking at your door…PEAL OUT IN UNISON & BURN SOME RUBBER IN STYLE!